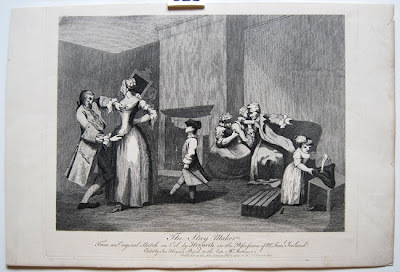 This print based on an early sketch by Hogarth, has the staymaker fitting a client in her home. Her son is looking on with great curiousity as another child is busily pouring a drink into fathers hat. He is lounging in banyan and cap while playing with the baby. The client is very interested in the fit of her stays and has her maidservant holding a mirror so she can check the fit of the back.